Simply double click to run. There is no install or uninstall procedure. Note you can Run as Administrator to view more processes (running under a system user, etc). To do this, right click on the icon, and select Run as Administrator. You can run CPUeye on startup, if you wish. Note that if you run CPUeye on battery your battery life will be slightly impacted. 1. Shows the top CPU users in alphabetical order. Uncheck individual items to remove them from the chart. Click on the process name to bring up more information. The CPU percentage shown is the percentage for the current second. The CPU Percentage column becomes CPU time when displaying the 10 minute, 1 hour, and 10 hour timespans. The CPU time is the amount of CPU used since the program started. 2. The chart line colors correspond to the color in the checkboxes in coloumn 1. The CPU percentage is shown second by second for two minutes. 3. Choose the time span to display. 4. 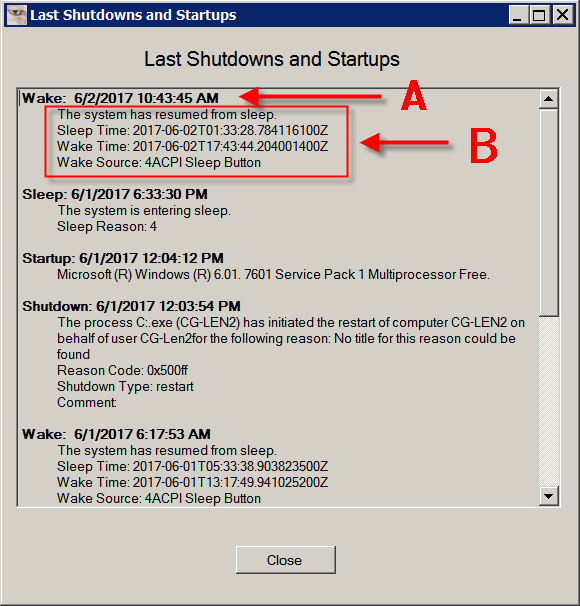 View Starts will display the last system startups and shutdowns. 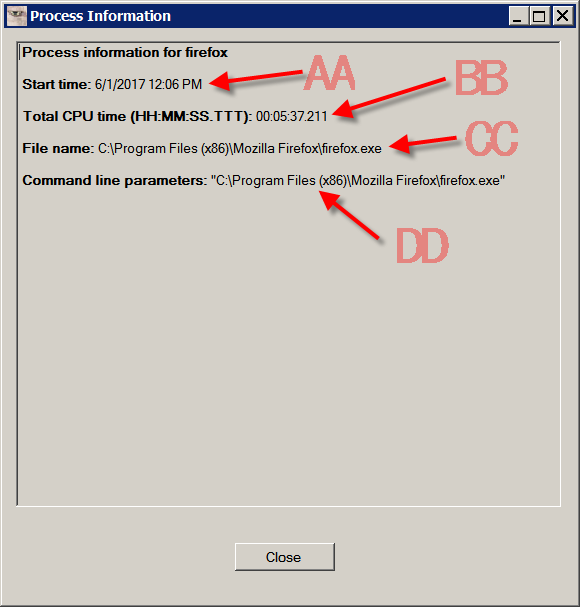 Clicking on the Process Name will display this screen showing some information on the process. AA. This is the start time of the process (current time zone). BB. 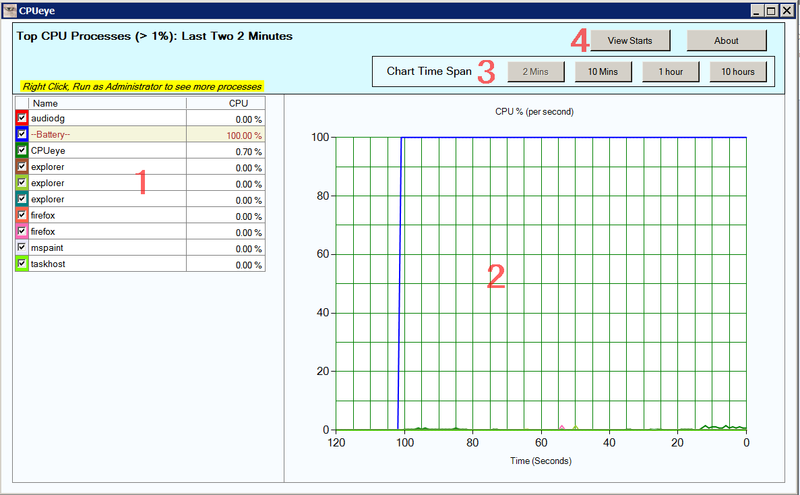 Shows the total CPU time used since the process started. CC. Shows filename and path of the process. DD. Shows command line parameters if available. Clicking View Starts will display this screen showing recent shutdowns and startups. You can get this information from the Event Log; CPUeye simply gives you a convenient way to view the information. A. The bolded text shows the type of action (in this case, Wake Up) and the time in your current timezone. B. The detailed text comes from the Windows Event Log. It shows the time in Zulu (GMT/UTC) and may give further information depending on the Windows operation that logged the event.